In December 2012, more than four decades after his father’s funeral, Paul Clever, 52, was sitting on an embankment in the Laotian jungle. He was exhausted, drenched in sweat, and feeling hopeless. He considered giving up after two days of wielding a machete through dense jungle. He asked himself if he had honored his father’s memory enough to be satisfied with his efforts. If he chose to quit, it meant going back to Mississippi without finding what might be left of his father’s remains. His answer: “No, I’m not there yet. Not yet.” Clever picked up his machete and went back to hacking his way through the jungle. The next day, his perseverance paid off: He found the crash site of the aircraft his father had been aboard when it was shot down during the Vietnam War. Tech. Sgt. Louis J. Clever was a thirteen-year Air Force veteran and senior radio operator with the 6994th Security Squadron. He was part of a classified mission, CAP 72, that left Pleiku Air Base to gather radio intelligence over the Ho Chi Minh Trail. The EC-47Q ARDF aircraft carried ten men, five from the 6994th Security Squadron—including Clever—and five from the 362nd Tactical Electronic Warfare Squadron. The plane crashed on February 5, 1969, close to the Ho Chi Minh Trail near the village of Ban Buong in Laos. The crash site was not discovered for four months; only partial comingled skeletal remains were recovered. Clever said the official documentation says that the plane crashed due to an engine fire, but it is now generally accepted that the plane was shot down. In November 1969 two caskets containing remains were buried in communal graves at Jefferson Barracks in St. Louis. DNA testing did not exist in the 1960s, which left no way for the families to know which loved ones rested in the graves. Jefferson Barracks was chosen because of its central location. Paul Clever, a diagnostic engineer, said that in 2006 he had unsuccessfully petitioned the Air Force and the Joint POW/MIA Accounting Command (JPAC) to reopen the investigation. After years collecting archival documents, Clever had concluded that crewmen aboard his father’s plane had been left behind. With his requests denied, Clever decided to take over his father’s recovery. He and his wife traveled to Laos in December 2012. They returned to the U.S. with more than three dozen bone fragments and other small artifacts. The communal grave at Jefferson Barracks was disinterred in January 2013. 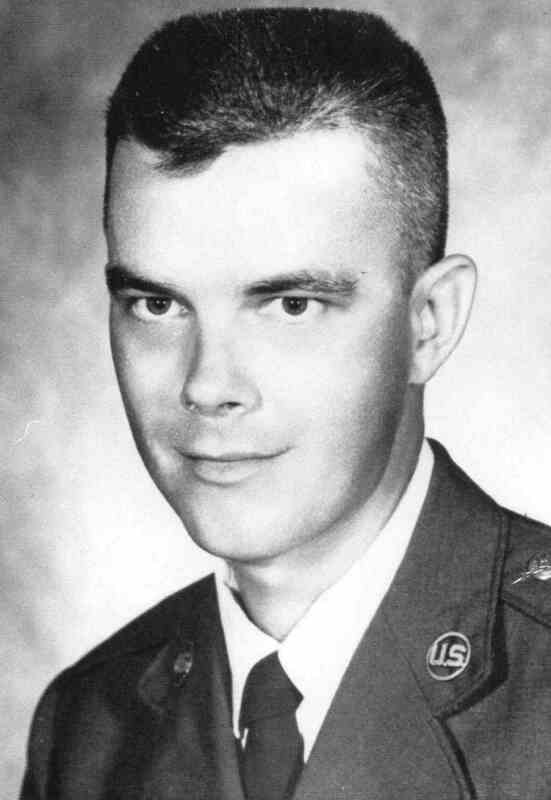 Sent for DNA testing at Offutt Air Force Base in Omaha, Nebraska, were the 1969 remains, the Clevers’s newly recovered remains, and remains discovered in an unrelated JPAC recovery mission that had also found an ID tag belonging to a CAP 72 crewmember. Allen Cronin of Air Force Mortuary Affairs said the time frame of the Jefferson Barracks disinterment was coincidental. The conversation to possibly disinter the CAP 72 crew was in process prior to Clever’s trip to Laos. Cronin said the process takes time, especially because the crew had been classified as accounted for as a group. The DNA testing identified seven men from the CAP 72 crash, including Louis Clever. The results leave three crewmembers still unaccounted for. Paul Clever said Air Force officials came to his home to present their findings. Part of the remains he had recovered were, in fact, his father’s. The evidence was there; he knew his dad was finally home. “I feel like I found the cure for insanity,” Clever said. “Because when you don’t know, it’s always with you.” Clever formed an organization called Maximum Recovery in Southeast Asia after his first trip to Laos in 2011. He funds it himself and plans to continue looking for other missing Americans. He credits his wife, a native of Thailand, for their success in finding his father’s remains. She speaks four languages and served as the translator and cultural expert during their recovery missions in Laos. They have been to Laos three times in search of missing servicemen’s remains. A fourth trip is planned later this year. “I know how helpful it is for the families to get closure,” Clever said. 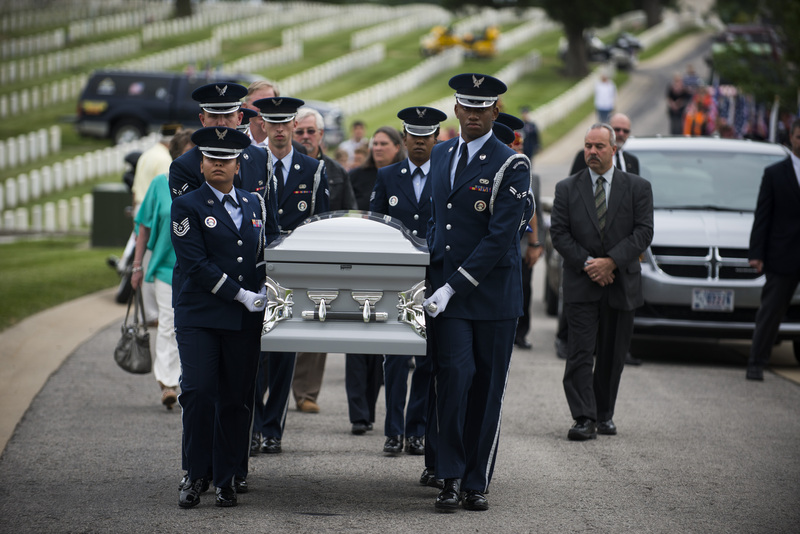 “That’s why we are continuing the search for more missing.” Paul and Nita Clever traveled to St. Louis from Olive Branch, Miss., on May 22 to inter his father’s remains with full military honors. Several veterans organizations from the St. Louis area joined together and planned a welcome home celebration for Tech. Sgt. Louis J. Clever. They also wanted to honor his son for bringing him home. VVA’s Fenton, Mo., Chapter 1028 became involved in early April. Chapter President Russ Whitener received funeral information from the local Gold Star Mothers chapter. Whitener, who represents his chapter on the Jefferson Barracks POW/MIA Museum board, said it seemed like a natural fit to contact Clever. “From the first time I talked to Clever I knew this was something I wanted to be involved with,” Whitener said. “VVA needed to be part of helping bring his father home and see to it that he was properly laid to rest at Jefferson Barracks with his wife.” Whitener immediately went to work enlisting the help of other veterans’ organizations. Everyone he called stepped up to help, including the Jefferson Barracks POW-MIA Museum. Plans included a reception and dinner the evening before the funeral. Whitener said giving Tech. Sgt. Louis J. Clever a welcome home celebration was not only the right thing to do, but it also held a deeper meaning for many Vietnam veterans. “Those of us who were lucky enough to come home in one piece remember the friends we lost over there. We weren’t able to be at stateside funerals and many wanted to be part of them, I’m sure,” Whitener said. “I think this helps. In the long run, it helps bring some closure for Vietnam veterans, especially the ones who lost good friends over there.” Patriot Guard Riders from several surrounding states joined Clever—himself a member—in an Honor Ride to St. Louis. “With Tech. Sgt. Clever it’s maybe a little payback,” St. Louis Patriot Guard Capt. Robert Smith said. “We can show at least one Vietnam hero the respect he absolutely deserves, even though it wasn’t done back in the 1960s and ’70s.” Large flags and a cheering crowd welcomed Clever and his group on the evening of May 21. Attendees included representatives from veterans organizations, local fire and police departments, and area politicians. R.P. Clever traveled from Pennsylvania to attend his brother’s funeral. “When we saw all the flags along the way,” R.P. Clever said, “I couldn’t believe it. If my brother were alive, he wouldn’t believe this.” After dinner, local VFW Commander Brad Denny said the Clevers “represented Americanism at its best.” VVA Chapter 1028 member George Collier presented Paul Clever with a handmade booklet. Collier did not know Tech. Sgt. Clever, but had been stationed at the same base. The booklet contained pictures and other items that would have been familiar to Clever while at Pleiku. Whitener presented Clever with a framed “Welcome home, Tech. Sgt. Clever” poster. He said the poster was not only from Chapter 1028, but from all Vietnam veterans because they were all his father’s brothers and sisters. Other gifts and recognitions were presented by the Jefferson Barracks Museum and many other organizations. Paul Clever, a Navy veteran, took the stage and talked about the merits of the warrior culture. “If you want to find the ethics, if you want to find the righteousness, if you want to find the ability to achieve the impossible—you have to have the strength of a warrior,” he said. “Either you accept it or you don’t. My life has become so full and rich because I accepted it.” Clever had a request for the dozens of veterans attending the funeral: He wanted everyone to form two lines facing each other and pass his father’s casket hand to hand from the funeral home to the hearse. He did not want his father to be pushed on a wheeled cart. “Fallen warriors should be carried by warriors,” Clever said. “I would like for everyone to participate and help carry my father on his final mission.” “Amazing Grace,” played on the bagpipes, filtered through speakers in the background. The flag-draped casket passed through each veteran’s hands. Clever, with his four-year-old son asleep on one shoulder and his wife at his side, walked slowly behind his father. He and his wife kept one hand on the casket until it reached the hearse. Clever’s mother, Deborah, was buried at Jefferson Barracks in 2005. She had never remarried. Her son had succeeded in granting one of her last wishes: He reunited his parents. When they came to the house to tell us you were missing I asked Mom to "Let me go and look for you. You were lost and I knew I could find you." Thank you for coming home like you promised. I will be seeing you again soon.